With its abundant spires of honey-scented flowers, this plant is a must-have for the wildlife garden. Although it is not native to Britain, the nectar-rich flowers of these plants are a magnet for British butterflies and moths and can attract up to 22 native species. There are now compact varieties more suitable for smaller gardens and these can also be grown in large containers. These plants are fully hardy and will enjoy coastal condition so make a perfect specimen for the seaside or wildlife garden. Buddleias should be planted alongside other plants that can sustain butterflies and their caterpillars. Care should be taken to deadhead these shrubs after flowering to prevent them from spreading into unwanted parts of the garden or into natural landscapes nearby. These plants can survive temperatures as low as -15 Celsius. 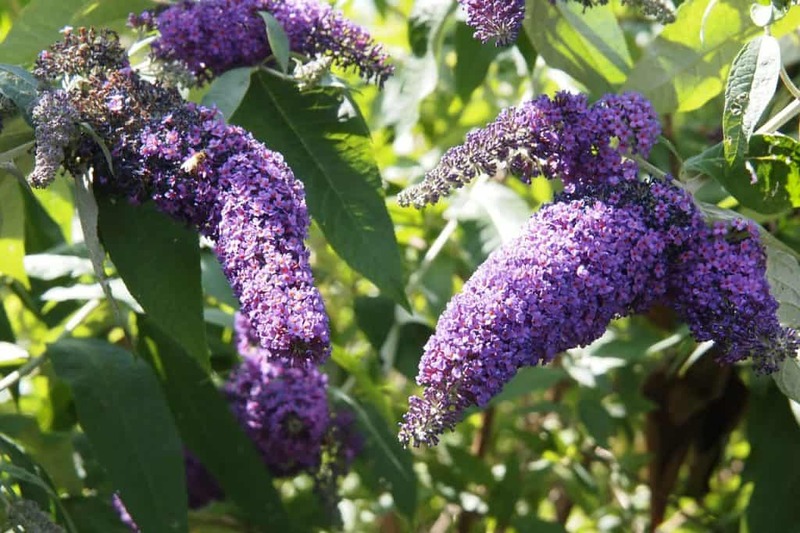 Buddleias comes in a range of different sizes, habits and flower colours. It is a hardy shrub with woody stems, narrow spear-shaped leaves and a profusion of flowering spires. Butterflies prefer the lilac coloured flowers over the white or maroon ones. The original buddleia, b. davidii is a large, vigorous bush that can become quite straggly if not well maintained. It usually flowers in August. This variety is considered an invasive species as it self-seeds so easily. To prevent this plant spreading to surrounding areas in nature, make sure you deadhead it thoroughly to prevent it from spreading seed. Newer cultivars tend to be more compact and less invasive than the original species. This means that many are suitable for smaller gardens and even containers. Pick your variety carefully to ensure it is suitable for your garden. B. davidii ‘Black Knight’ has gorgeous, fragrant indigo-purple flowers. This easy to grow variety is hardy and drought resistant and will reach a maximum height of 3 metres (10 feet). It can, however, be pruned to keep it more compact if required. B. davidii ‘White Profusion’ has elegant spires of white flowers on a shrub that is nicely bushy. It can reach a height of 4 metres (13 feet). B davidii ‘Pink Delight’ has bright pink, orange-eyed flowers and reaches a maximum height of 4 metres (13 feet). B. davidii ‘Royal Red’ has lovely scented red flowers on a shrub that reaches 4 metres (13 feet). B. davidii Nanho Purple ‘Monum’ is a more compact variety reaching 1.5 metres (5 feet) in height. B. davidii Nanho White ‘Monite’ is a nicely scented, compact white variety that will reach around 2 metres (7 feet). ‘Lochinch’ is a hybrid variety with lavender-blue flowers and silver-grey leaves. It can reach a height of 3 metres (10 feet). Buddleia x alternifolia ‘Argentea’ can reach a height of 3.5 metres (12 feet) and has a lovely weeping habit. It has intensely fragrant pink flowers in July and August and velvety silver leaves. Buddleia x alternifolia ‘Unique’ is a compact shrub that flowers from July through to October. It has long, fragrant lilac flowers. The flowers are sterile, so this plant will not self-seed around the garden or neighbourhood. Buddleia Buzz is a dwarf variety that has been cultivated specifically for growing in pots and containers. There are several different colours available from Buzz ‘Sky Blue’ to Buzz ‘Indigo’ and the lovely pink Buzz ‘Magenta’. Buddleia is very easy to grow. In fact, you will often see it growing happily on wasteland or around factories and railway lines where it has seeded itself. It is unfussy about climate and soil type and is susceptible to few diseases. Buddleia do best in full sun to partial shade. As long as they get a few hours of sun each day they will be fine and flower well. These plants are drought resistant and, once established, will not need watering unless the weather is very dry. In drought conditions, they should be watered thoroughly once a week. They may need more water during the spring, if there is insufficient rainfall, a this is when they are growing the most. Container grown plants will need watering as they dry out. These plants will do well in most soils as long as they are reasonably free draining. They hate sitting in wet soil over winter. They do particularly well on chalky or lime soils. These plants do not require fertilising and in fact, feeding them may encourage them to produce foliage at the expense of flowers. Container-grown plants should be fed yearly, in spring. You should plant your shrub in spring once the worst of the bad weather is over and the soil has begun to warm. Wait until daytime temperatures are around 10 degrees and night time lows are no longer below zero. Your buddleia should be positioned at the same level in the ground as it was in the pot. Water it well and continue to water regularly until well established unless the weather is wet. If growing in a container use a loam-based potting compost. Deadheading your shrub will encourage it to produce more flowers. At the end of its flowering period, it is wise to remove all spent flower heads to prevent them from going to seed and spreading seedlings all over the surrounding area. Container grown plants should be positioned in a sheltered spot over winter. You may like to wrap the pot in fleece or bubble wrap if you expect very cold conditions. It is also advisable to remove the top couple of centimetres of compost each year and replace with fresh. Large varieties will only survive for a year or two in a pot before they become too large. However, new dwarf varieties are available that are suitable for growing in containers. If your butterfly bush becomes root bound it will need repotting into a larger container or planting out in the garden. Larger varieties will not thrive for more than a year or two if confined to a pot. The flowers of this plant have a golden eye which looks good when picked out by other orange flowers. Black-Eyed Susan (Rudbeckia fulgida) is a good choice and butterflies will love this plant, too. The leaves of this shrub also look nice with silver-leaved plants such as nepeta and artemisia. As part of a butterfly or wildlife garden, buddleias are hard to beat. If you grow one, you will likely see Red Admiral, Peacock, Painted Lady, Brimstone, Comma, Large White, Small Tortoiseshell and Meadow Brown butterflies on a regular basis. 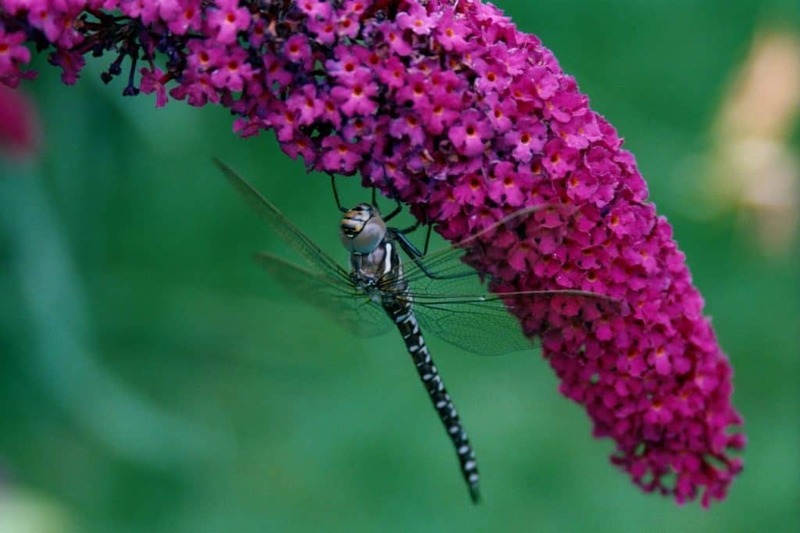 Consider planting it among other plants that butterflies love such as red valerian, verbena, sedum and hebe. This will ensure a continuous supply of nectar over the summer months. 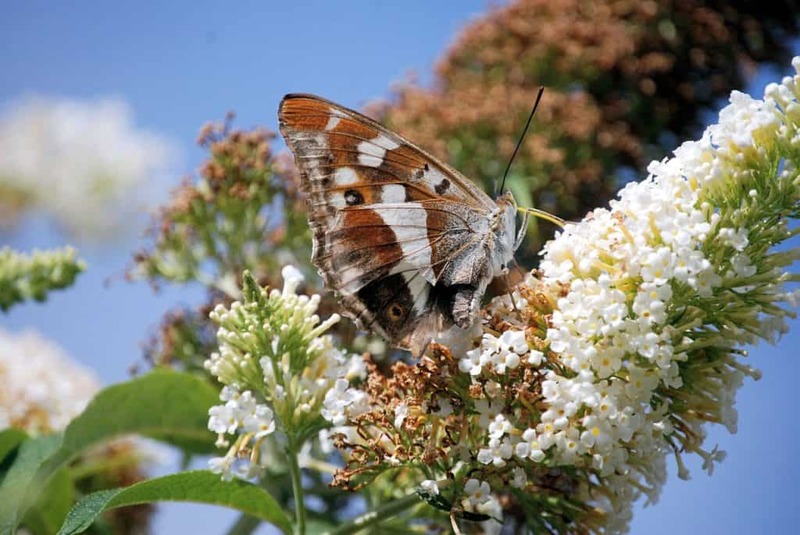 Butterflies will enjoy the nectar of buddleias but to provide a good environment for these beauties you should grow other plants that will provide shelter to their caterpillars. Nasturtiums will provide a place for the cabbage white butterfly to lay its eggs. Other great hosts for caterpillars include nettles, lady’s smock, holly, ivy, garlic mustard and buckthorn. Buddleias benefit from a regular good prune. Cutting back this shrub will encourage it to stay compact and vigorous. Left alone these plants tend to get woody and straggly with flowers only appearing at the tops of the stems. Pruning will encourage more flowers lower down the shrub. B. davidii produces flowers on the new growth so can be hard pruned in early spring and cut back either close to the ground or down to a woody framework. Pruning should be done in late spring once the worst winter weather is over. Aim for a short, strong framework of five or so main branches. This will keep its size in check and ensure plenty of flowers. B. alternifolia needs pruning after flowering in late summer. Cutting this type in spring would result in no flowers the following summer. This type does not require such a hard prune. Simply cut back the stems that have just flowered to either a healthy bud or lower stems that have not flowered. If your B. alternifolia has become overgrown and straggly it is best to cut it back in stages. In the first year, cut back half of the shrub and repeat the process with the other half the following spring. This will ensure your plant does not get too stressed. The best way to propagate buddleias is by taking softwood cuttings. These plants are fast and easy to cultivate in this way and you will have new, flowering shrubs in as little as a year from taking your cuttings. Take cuttings in the late spring as the stems begin to harden slightly. Choose shoots from the current year’s growth and cut them about 15 cm (6 inches). Trim the base of the cutting to just below a leaf node. Pinch out the soft tip of the shoot and remove the lower leaves. Dip the stems in hormone rooting powder and insert into prepared pots. The pots should be filled with a mixture of potting compost and horticultural grit at a proportion of approximately 50/50. Make several holes around the edges of the pots to insert the cuttings into. Water the pots and cover with a plastic bag secured with an elastic band. Alternatively, they can be placed in a cold frame or cold greenhouse. Check your cuttings weekly. Remove any dead or dying material and water them. Once you see signs of the leaves perking up or roots emerging from the drainage holes at the bottom of the pot, they are ready to be potted up individually. In general, buddleias are hardy and disease resistant plants that should not give you much trouble. Occasionally they may fall prey to certain pests and diseases but with a little care your plants will remain healthy and provide you with years of colour. Sometimes buddleias can become infested with spider mites. These tiny insects are hard to see. However, if you place a piece of paper beneath a branch and shake it you may see some tiny orange-red or green mites fall onto the paper. You can remove the mites with a strong jet of water or by thoroughly coating the leaves with an insecticidally soap. Your buddleia may also become host to nematodes. These are tiny roundworms that eat the roots of the plant. It is hard to eradicate these pests, however keeping your plant in good health with help it to remain healthy despite the attack. Avoid overwatering the soil as these insects thrive in wet conditions. Your plant may also benefit from a dose of fertiliser as it may be struggling to get all the nutrients it needs because of damage to the roots. This problem occurs when the temperature is cool, and the plant’s leaves remain wet for a time. Furry patches of mildew will appear on the undersides of the leaves. The tops of the leaves may also become yellow or brown. Heavily affected stems should be removed and disposed of. Ensuring good air circulation will reduce the chances of downy mildew. Cut back plants that are growing too close together and thin the centres of the plant to allow air to circulate. Remove any weeds and dead leaves from around the plants. If the problem is extensive you can treat this disease with a fungicide. Always water the plants at the base rather than on the leaves and water early in the day to avoid the leaves staying wet for long periods. Occasionally your plant may be affected by a root disease such as Rhizoctonia or Phytophthora. Rhizoctonia may cause yellowing leaves and, with Phytophthora, you may see yellowing leaves, smaller than usual flowers and even some rotting stems. Both these diseases affect the roots of the plant and make it impossible for them to provide water and nutrients to the plant stems. They usually occur when the plant is sitting in waterlogged soil. Improving drainage can help. You can also apply a fungicide to the soil. These diseases can be fatal to your plant, so it is best to ensure you never plant buddleias in waterlogged soil. Q How can I tell which type of buddleia I have? The most common type of buddleia is B. davidii. This flowers from August onwards and has flowers of purple, dark purple, red, lilac or white. It has an arching shape. The less common B. alternifolia has alternate leaves and is deciduous. Its flowers are light mauve and come earlier the davidii, usually early to mid-summer. They also tend to have a more weeping shape. Q I’ve heard that Buddleia is considered an invasive species. Should I get rid of mine? Buddleia davidii does spread rather easily and can be found in wasteland and along railway tracks. These shrubs can outcompete native plants and cause damage to the ecosystem. If you are happy with your shrub though, there is no need to get rid of it. As long as you deadhead it before it has a chance to set seed, then it will not get an opportunity to spread. However, if you would like to plant a less invasive species, you might like to try b. alternifolia instead. Q My butterfly bush is not flowering. How can I get it to produce new blooms? There are several possible reasons why your buddleia is not producing flowers. Initially, you should check that is planted in a suitable situation. This plant needs free draining soil and a position that gets a reasonable amount of sun. It hates to sit in wet soil and may become susceptible to root diseases if this is the case. However, it does not like to be too dry, especially in spring as that is when it puts on the most growth. If you recently planted or transplanted your shrub it may be suffering from transplant shock. A healthy flowering plant may stop blooming after being moved as it will be concentrating its energy into new root growth. If this is the case, you just need to give it a little time to adjust to its new position. The final possible cause of your plants failure to flower is pruning at the wrong time. While b. davidii can be pruned in spring without affecting the flowers this is not the case for some other types. Check which variety you have and make sure you are pruning it at the appropriate time.